Simar pasture in Dudhatoli forest division, Chamoli district of Uttaranchal, appears sparkling fresh. The memorial to Chandra Singh Garhwali -- who as a soldier in the colonial army refused to fire on Pathan protesters, and was consequently tortured and incarcerated by his British employers -- has got a fresh coat of paint. A red flag flutters atop a post near the memorial reminding onlookers that Dudhatoli's iconic son was also a communist. Small eateries dot the few shaded edges of the pasture. Dudhatoli is getting ready for a meet to deliberate the future of khark -- mid-altitude pasturelands. 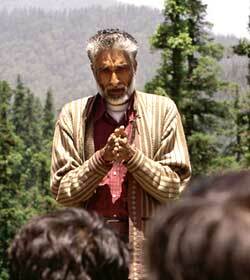 Garhwali had devoted much energy on their conservation after returning home in 1946. "But now," says Dileep Singh, van panchayat head from nearby Gaur village, "the khark are under threat. If we don't come together, our society might lose its only source of steady income." That's precisely why van panchayat heads from all over Uttaranchal have gathered at Simar. Hem Gairola, founding member of the Himalayan Centre for Community Forestry, a think tank in Uttaranchal, sits exhausted in a chappar -- a temporary hutment fashioned from oak wood and slate roofs. It has taken three years of mobilisation for Gairola to get the meet going. But the efforts have not been in vain. 100-odd leaders have gathered for the two-day meet. Most have had to walk four to five hours to reach Simar. 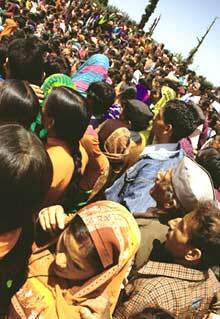 Understandably so, a gathering like this has not happened in the khark since Garhwali's days. A festival commemorating Dudhatoli's iconic son will follow the meet. The celebration has more than symbolic significance. The leaders and organisers of the meet realise that nothing short of a mass movement will revive the khark. They also know that such movements require icons, and who better to invoke than Garhwali. 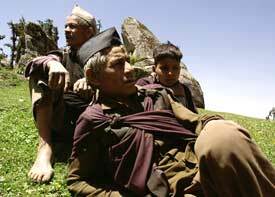 Khark are found along ridges at heights varying between 7,000 and 11,000 feet. Unlike their alpine counterparts, these meadows are not very large. They vary from a couple of hectares to a few hundred: lush monsoon-fed grasslands with mixed oak forests. 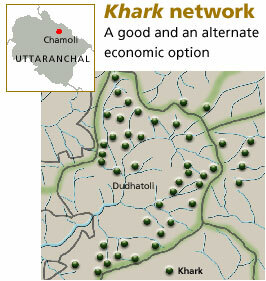 Dudhatoli's khark network comprises 99 meadows (see map: Khark network) and covers 25,744 ha -- designated as reserved forests under the Indian Forest Act, 1927. The pastures are located 8-18 km away from the closest road heads in either direction. Dudhatoli is right at the heart of Uttaranchal, close to Gairsain -- the town once proposed as Uttaranchal's capital, located at the junction of Garhwal and Kumaon region. Three large, important and perennial non-glacial rivers of the region originate from the khark: the Poorvi Nayyar, Attagad and the famous Ram Ganga. There is no large snow melt. A small trickle of water in tiny streams, some seepage into soil, a decent run-off and before one realises, the rivers are hurtling down to the valleys. But make no mistake: these seemingly non-descript water bodies are critical for Uttaranchal's agrarian economy. A mere 7 per cent of the land in the state is cultivable and this sparse land has to be well-utilised. So, nutrient-rich water from the perennial rivers is a must to keep agriculture economically viable. That, however, is not the only economic importance of Dudhatoli's khark. In local language, Dudhatoli means the "cradle of milk". The appellation is appropriate: Dudhatoli's pastures supply fodder to livestock in the neighbourhood. And they do so in times of scarcity. Usually fodder dries up in hills during summer -- March to July -- and farmers move to nearby grasslands. But there are no low-lying grasslands in Dudhatoli's vicinity. Pastoralists here simply migrate to the "cradle of milk" with their buffaloes. For four months the khark here teem with the herds. The herds are shepherded by the elderly and the children. "In peak summers the village has very little work for the elderly, and there is also very little food and grain for them," explains Ghamand Singh, a van panchayat leader. "They cannot undertake hard physical labour. So, they are sent with buffaloes to the khark. The young ones follow. Our society has devised this method to utilise energies of the aged and children," he adds. The practice is more prevalent among poorer households, which have no other option. The meadows here are officially designated reserve forests, but pastoralists have grazing rights, nevertheless. Cultivation is also allowed on small patches where potatoes are cultivated. In a survey of 100 villages, Gairola found that these herders usually came from around 90 villages in three districts. "People here have a strong tradition of van panchayats -- community-controlled forests created in 1931 under a special act. They adhere to community rules in these forests. But they go berserk in the pastures," says Gairola. "There are no rules to regulate usage of khark," he adds. The simple economic logic that a community invests in only what it owns has protected van panchayats. But lack of ownership has meant that khark remained orphaned even though they have been milked well. These lands were once community-controlled. 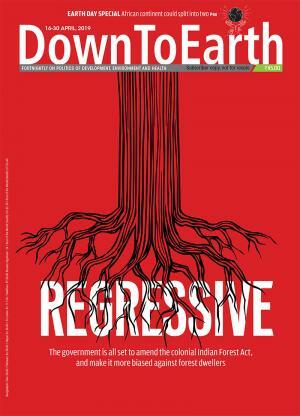 Today the forest department has jurisdiction over them, but it does not have the manpower to regulate usage. The department's sporadic activities only antagonise the community. Most villagers don't deny that their rampant cutting harms the region but as Gudal Singh from Ramnna village says, "Give us an option before you take the last one we have away. Else, you can call our activities illegal, it makes no difference to us." "Hand over the land to van panchayats; let them regulate traffic in the khark. If they can protect their forestlands against all odds, they can do the same with the khark," reasons Gairola. He suggests that once the khark are handed over to the community, their management should be deputed to a federation of van panchayats.
" Van panchayat leaders have vast experience. They have cultivated forests in the same ecological niche for several decades now, let them manage the pastures as well." The two-day meet at Simar reverberates with this idea. "We should start our own cooperative, collect milk and sell it to the processing unit 45 km away," says Dileep Singh. "Some day one could brand the milk and the ghee," he says. That's being little too hopeful: The Geographical Indicator System of branding a product to ensure copyrights over it is only half a reality in India today. "The community should control forest lopping too, systematically block off some portions for regeneration. Over grazing should attract penalties," adds another participant, while another van panchayat leader talks of eco-tourism: "We can gain much by showcasing our abundant natural wealth." Collectively, much is possible. Medicinal plants have a huge commercial potential. And the van panchayat leaders are well aware of their collective powers. The maturity in the gathering shows when one leader argues, "We should not grow too many high value plants or the value of land will rise. That won't be good for us." The heads are also aware that they can collectively bargain with the forest department for simple requirements as with electricity and other basic amenities. More importantly, they believe that collectively they can take on the department even on matters like taking over the khark -- that will require legislative changes, however. The assembled leaders also know that in unison they can deal with errant members of their community, and also take on the Bhutiyas. The gathering is only the first step. As the festivities bring together thousands -- including politicians keen to observe this historic alignment of villages -- the village elders along with Gairola decide upon a select group to lead the people towards a collective bargain with the government. By afternoon of June 12, the festivities are over and the van panchayat leaders are done with their deliberations. But they will need more than one Chandra Singh Garhwali to carry the meet's gains further -- debate the matter among themselves and then take their decisions to the government.